Idea for a place like this, originally was from the Far East. This lounge bar is a mix of impressions and inspiration from exotic places – Bali, Morocco, India. With a desires to provide a new concept, created as a completely relaxed, comfortable atmosphere, where you can endlessly lie, barefoot on colorful cushions and carpets. Tucked in a real jungle vegetation, and with an indispensable impression of a moment which awakens in you. Feels like that maybe, you are not in Belgrade. All the elements of Boho Bar are synthesis of the bohemian style. Which creates an atmosphere of freedom, lightness and informality. With highly accurate and non-commercial musical concept, the whole impression of this lounge bar invites you to step into an oasis that you can easily impress your exotic side. Boho has numerous alcoholic and nonalcoholic beverages, wines and premium drinks. also very popular is fresh lemonade with fruit flavors and special Boho bar cocktails, designed according to a special recipe. Music concept of Boho bar is based mainly on electronic music: non-commercial deep house sounds, lounge and chill out sounds, with occasional “flirting” with oriental sounds. 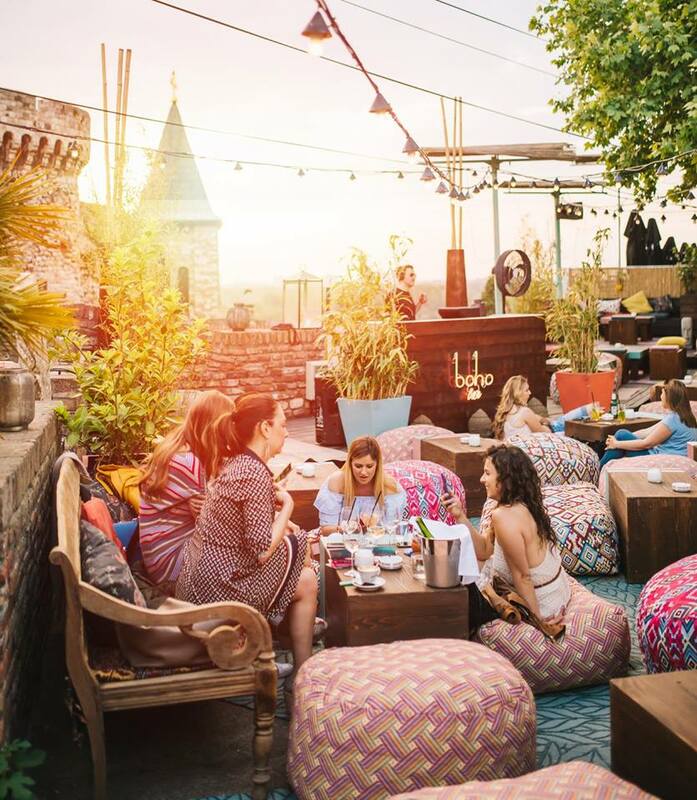 Boho becomes one of the most popular bars in Belgrade in no time. At Boho Bar, from Thursday to Sunday are spinning the most famous names of Belgrade’s DJ scene, and Boho occasionally organize appearances of famous foreign DJs. On a weekly basis, to be accurate, on Wednesdays, is organized “OPEN AIR” cinema where films are projected which you can enjoy with famous Boho popcorn. Weekends are popular because of the performances by local DJs from sunset-till morning hours. On a monthly basis they organize the events – exhibitions of foreign artists, some of them are musical, some are art performances. At the very opening, the guest was Yusura from Japan, who performed an amazing performance – Geisha with fire. Event was hosted by the famous Dj compositor Tender Games, who performed in live form (electronic music that is playing live) his compositions, and made a blasting atmosphere that night. Boho is located at Kalemegdan fortress, at the place where one of the most famous summer clubs was – Terassa Lounge. Weekends: 12 pm to 03 am.